Last week, an invitation to a Lebanese food themed dinner party was quickly followed by the kind request to supply suitable Lebanese flatbreads. 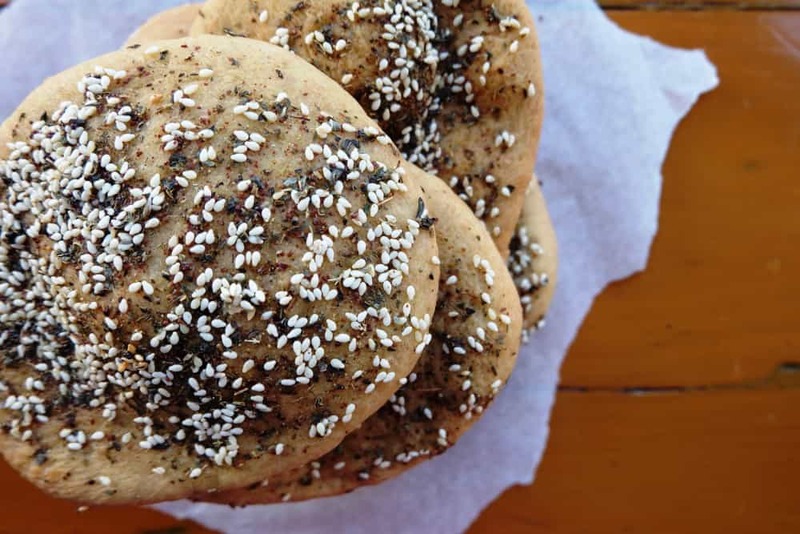 I was more than happy to oblige by baking a batch of manakish za’atar! On the menu was a fantastic spread of delicious Lebanese mezze from homemade labneh and tabbouleh to baba ghanoush followed by a main course of lamb meatballs in a spinach and yoghurt sauce. 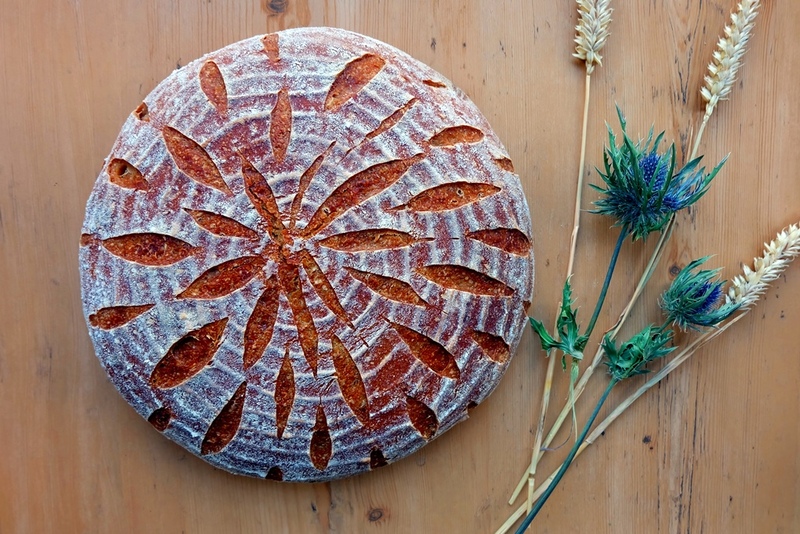 So, off I went on the search for matching breads. Having never been to Lebanon I had to base my research on recipes from books and other bloggers’ experiences. 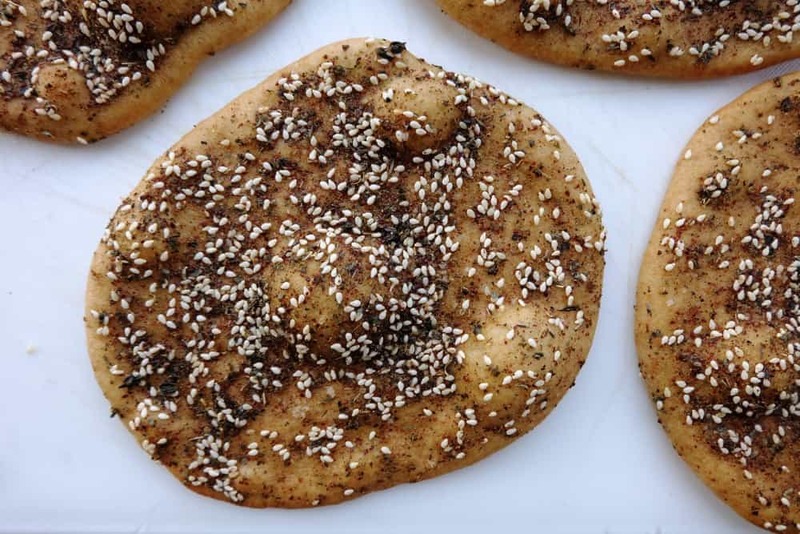 Manakish (also manakeesh or manaeesh) seemed to be most feasible in the absence of a saj or tandour oven and also the most versatile. This is my version of manakish za’atar – an attempt to evoke the flavours of Lebanese cooking in my Northern European kitchen. I was helped by a fellow baker who shared her copy of Barbara Abdeni Massaad’s stunning book Man’oushé: Inside the Street Corner Lebanese Bakery for inspiration. For the manakish dough – For my Lebanese flatbread recipe, I work with the same dough ingredients as used in my pita bread recipe. 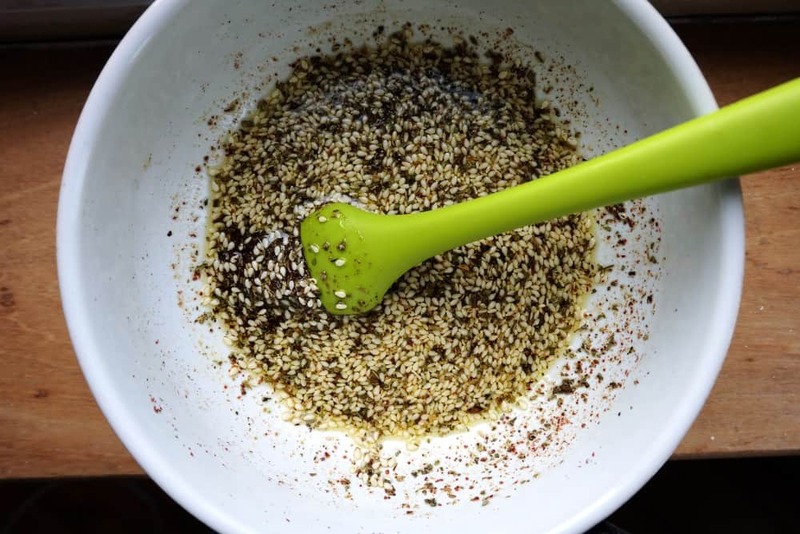 For the Lebanese za’atar paste – In the absence of the essential herbal ingredient za’atar (wild thyme), I used 4 tbsp fresh oregano leaves, 2 tsp dried thyme and 2 tsp dried marjoram, added 4 tbsp toasted sesame seeds, 2 tbsp ground sumac,1/2 tsp ground cumin, 1/2 tsp salt. Combine in a small bowl and mix well with 6 tbsp olive oil. 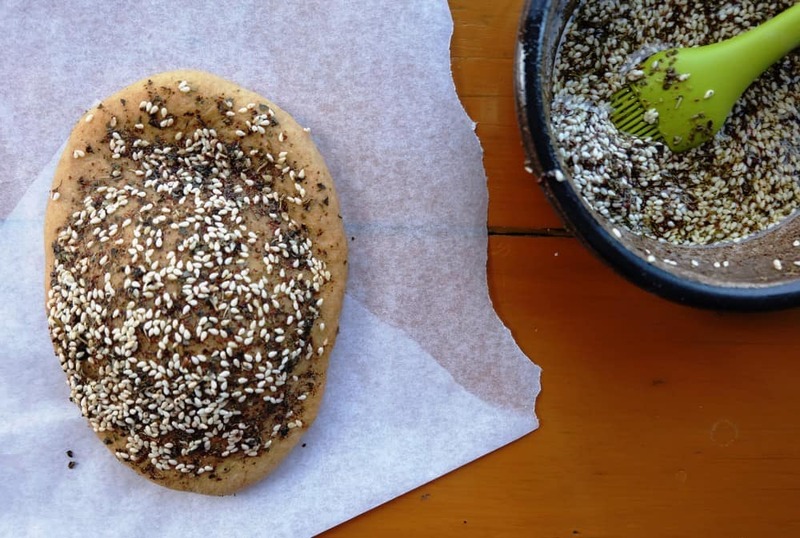 Follow steps 1 – 9 of my pita bread instructions. Turn the dough out onto a lightly floured work surface, deflate gently, then divide into eight equal pieces. Shape each dough piece into a firm ball, cover with a tea towel and let rest for 20 minutes. Preheat the oven to 200°C and place the baking tray at the bottom shelf to heat up. Flatten each ball, then roll – one by one – into a round or oval shape about 3 mm thick. Place the dough rounds on baking paper measured on your baking tray. Only four manakish fit onto my baking tray, so I roll out four at a time and while they’re baking I get onto the next four. 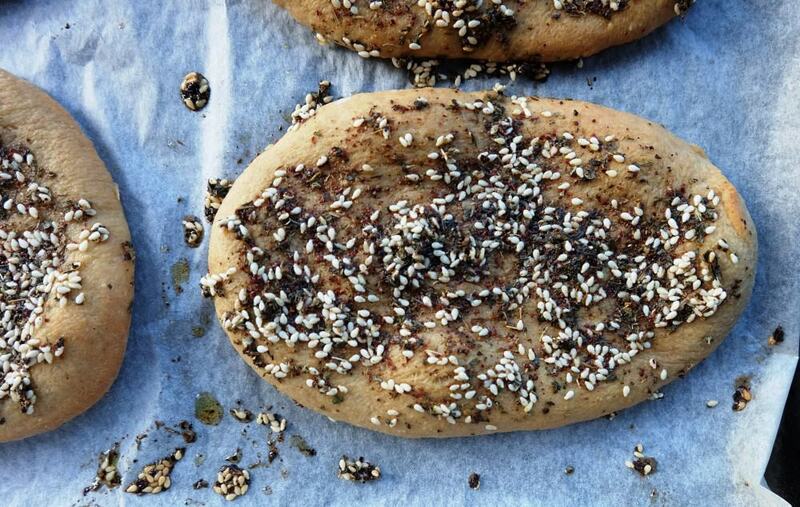 Brush the breads with 1-2 tbsp of the za’atar blend, spreading it to within 5mm of the edge. Slide the baking paper with the flatbreads onto the hot baking tray, place back on the lowest shelf in the oven and bake until lightly golden, for about 10 minutes.